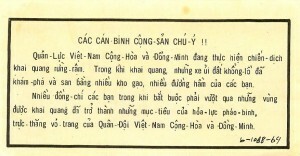 Through the use of propaganda leaflets dropped by helicopters flying over the jungle, the Chieu Hoi program (loosely translated as Open Arms) sought to encourage the Viet Cong and the North Vietnamese Army to surrender to the Americans or South Vietnamese forces. 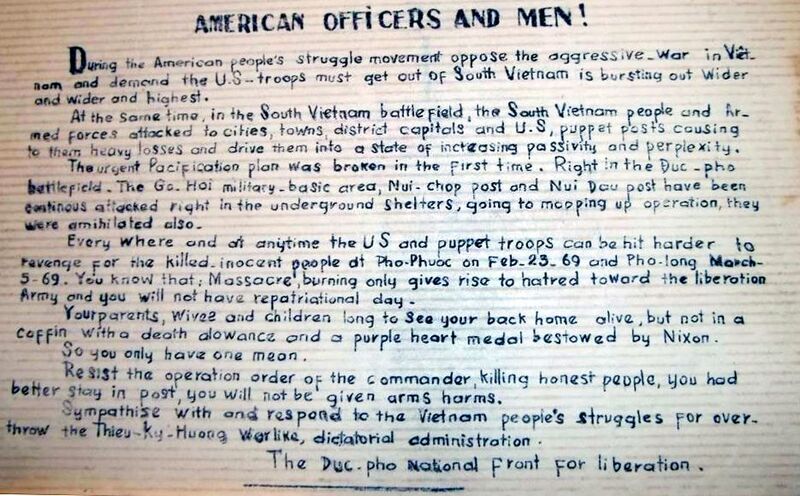 Soldiers of the 209th Regiment,7th Division, North Vietnam – Attention! On the 27th of December, 80 of your comrades in Regiment 141 had to sacrifice in a horrible death. Your 209th Regiment had suffered a complete defeat during the Fall campaign. Until now the ARVN and Allied troops have continued to pursue in order to destroy your regiment. Therefore,it would be certain that it would be your turn to be sacrificed pitifully and needlessly. You should save yourself by rallying to the government side or allow yourself to be captured as a POW of the RVN in order to escape death. The Army of the Republic of Vietnam and Allied Force are carrying out the campaign of deforestation. During this,gigantic earth-movers have uncovered and leveled many of your rice storages and secret tunnels. Many of your comrades,forced to cross deforested areas,have become targets of artillery fires and armed helicopters of the ARVN and Allied Force. You will have no place to hide !!! WHAT WILL YOU CHOOSE IN THE NEW YEAR? 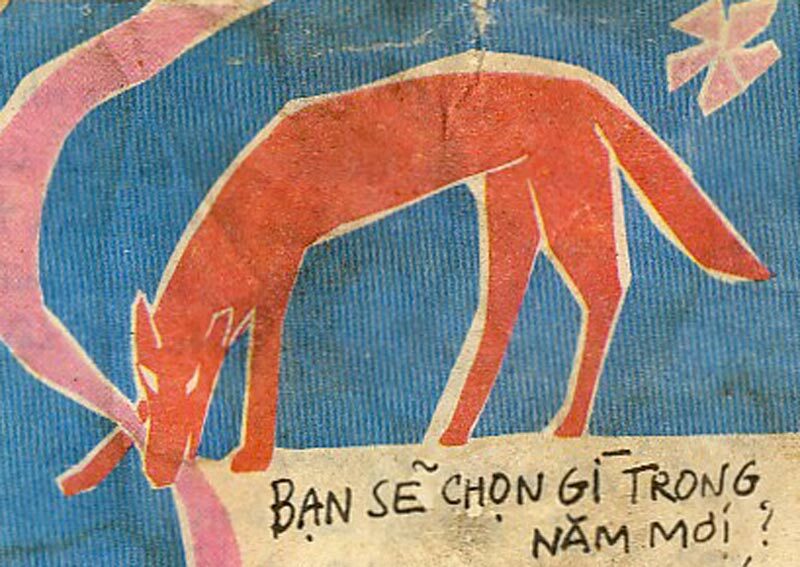 The Year of the Dog is returning to the Viet people! Everybody is happy to gather the family together to greet the new spring. How many Tet have you been away from home, do you know? Who forces you to make such a sacrifice ? 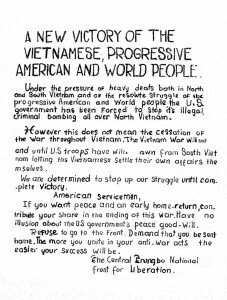 Surely it cannot be the people of South Vietnam because at this moment they are joyously greeting the Spring amidst their united and peaceful family. You have to bear the sacrifice, to be away from home, away from your loved ones because of the crazy ambition of the North Vietnamese Communist leaders who want to also put the Southern part of Vietnam under the slavery of the International Communists. The coming of Spring brings new hope to us all, including you. The prospect for Peace has appeared in the horizon, and this Year of the Dog has to bring about a good future for our people,if you make an early choice. On the occasion of the new Spring, you should lean towards Peace,and resolutely choose a path that is bright and full of meanings. 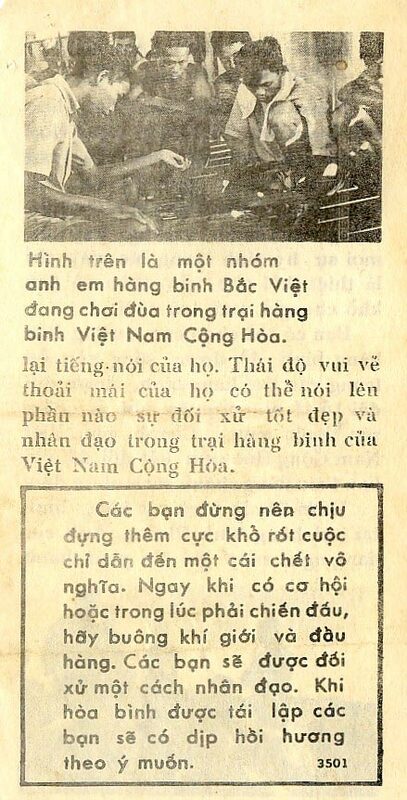 The path of Chieu Hoi (Rallying to the National Cause) of the RVN will certainly help you realize this choice. DON’T MAKE A MISSTEP AND NOT WALKING SIDE BY SIDE WITH YOUR LOVED ONE. But without you I feel alone and shameful. The Spring in the Year of the Dog returns for all the Vietnamese,in the North as well as the South. Every family are prepared to greet the Spring in a feisty atmosphere according our people’s ancient customs. How about you? 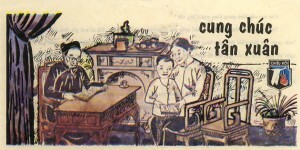 There is a saying that “A child with a father is like a house with a roof.” Regardless of how merry the Tet celebration is,without the presence of the father,the family’s happiness is incomplete. 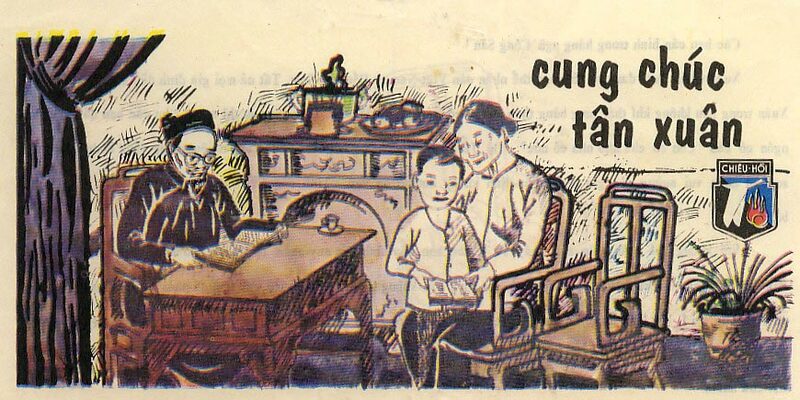 The family bond of the Vietnamese cannot be easily overcome/disregarded/overlooked. With Tet’s festivities,please take your time to really think and ask yourself how many springs you have been away from home! Does your sacrifice have any meaning,is it worthwhile? How many lonesome springs have your wife, your children,and your parents had to suffer! Once your patriotism has been abused by the communists,the only reasonable thing left for you to do is to return to the true Nation,People, and Family,so that you can have again the opportunity to fulfill the duty of a son,a father and a husband. 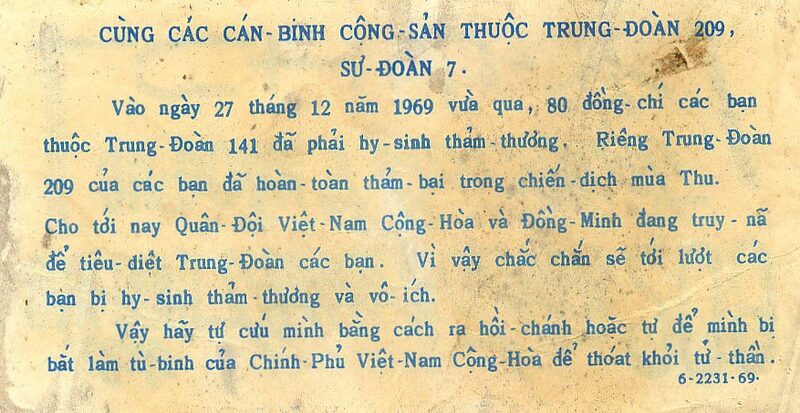 In the directive no.1/4 dated April 2 1968 sent to units of “the People’s Liberation Armed Force,”the Central Office of South Vietnam (COSVN) has ordered commanders to engage in large battles to support the negotiation in Paris even at the cost of heavy casualties. For that reason,you have seen in the past days the pitiless death of many of your comrades. Can you and your comrades triumph in enslaving South Vietnam? Certainly not. Because you are not on the side of the righteous cause, your real strength is too weak to be compared to the ARVN and Allied Troops, and esp. the bureaucratic commandism and pie-in-the-sky approach of the party leadership and government in the North has led you to many failures. 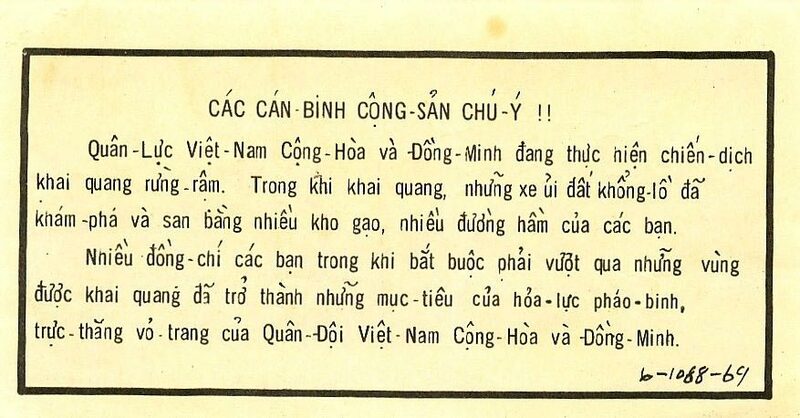 Before the exceptional maturity of the ARVN and the strength of the anticommunist resistance of all of the Free South Vietnamese,you have no hope for any victory on the battlefields. For that reason,all the sacrifices at this time will only be personal loss to you and your family. 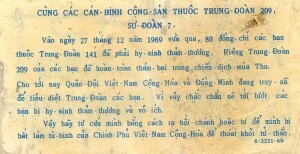 You can choose the path of surrender and will enjoy a peaceful life in specially set-up camp,be treated decently with lodging,food,and medicine… The Republic government of South Vietnam pledges to welcome you according to our humanitarian policy. The above picture is a group of surrendering North Vietnamese regulars playing in the RVN’s camp. … to the recorder playing back their own voices. Their happy and pleasant attitude demonstrates a part of the fine and humane treatment in the RVN’s camps. 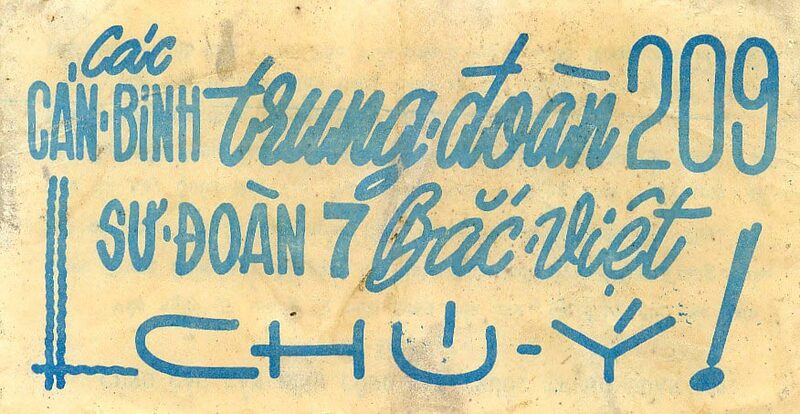 When captured in South Vietnam, most communist soldiers suffer sickness. Although caught as POW,they are very fortunate because their health are well taken care of. You will be given the same treatment. IF CAPTURED,YOU SHOULD FEEL AT EASE BECAUSE YOU WILL BE TREATED HUMANELY AS THIS POW. 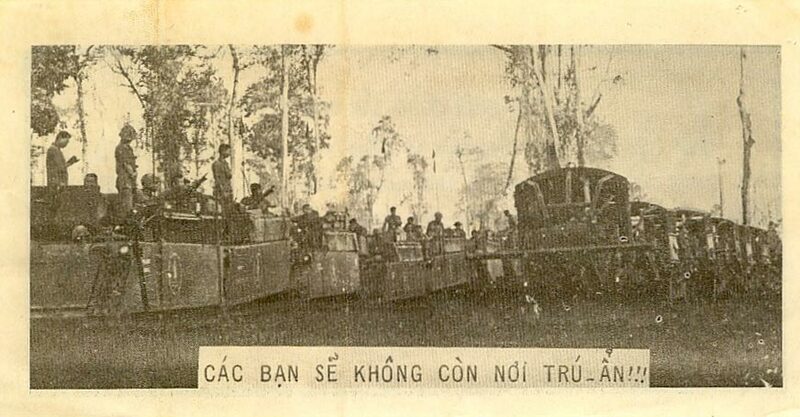 When it is said that North Vietnamese troops will be mistreated and killed if taken prisoner, the cadres have lied to you. Many communist troops have been captured by the ARVN and Allied Force but they are still alive. Furthermore,when the POWs fall ill,they are well cared for. 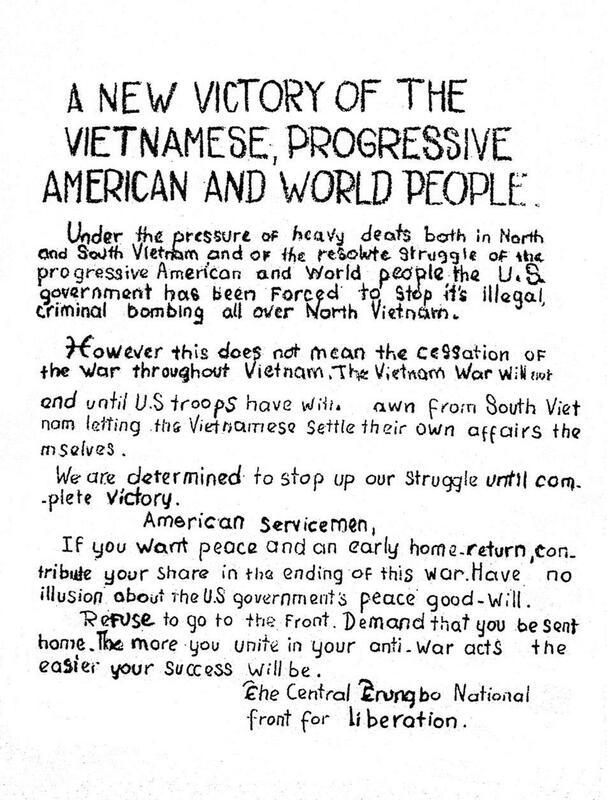 The leaflets below were made by the National Liberation Front and meant to demoralize American troops. 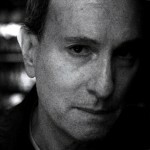 The first was found in Pinkville, associated with the My Lai massacre. 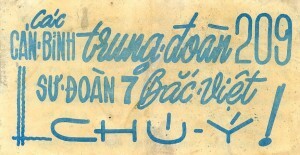 The second was found in Duc Pho. Courtesy of Tony Swindell, 31st PID, 11th Light Infantry Brigade,1968-69. Wikipedia entry on Chieu Hoi leaflets. 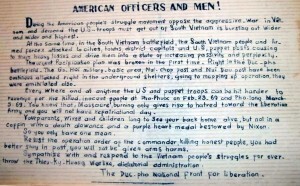 Psyops (psychological operations) exploited the Vietnamese belief that the soul does not rest until it is properly buried.